Ontario cannabis retail stores opened on Monday with roaring sales of $50,913 on average the first day of opening. According to Cova Software, a cannabis retail software provider, seven out of 10 stores averaged 867 transactions with an average sale of $61.82. The Hunny Pot Cannabis Co. was Toronto’s only legal cannabis retail store to open up. An unnamed manager claimed that it had about 800 transactions in just three hours of business. Other cannabis stores in Canada that Cova tracks averaged $4,976 sales per day over 111 transactions during the first quarter. Cova expects strong sales in Ontario cannabis retail stores for the next several weeks before levelling off closer to national averages. That would mirror what happened in the rest of the country after cannabis was legalized in Canada on October 17, 2018. 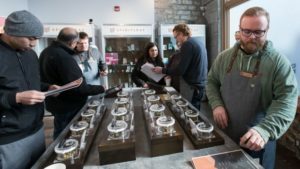 Only 10 of the 25 Ontario cannabis retail stores that won the cannabis retail licence lottery opened on April 1. German newspaper Handelsblatt reported on Wednesday that Aurora Cannabis and Aphria were among the companies awarded “lots” to cultivate cannabis in Germany. The medical cannabis market in Germany could be worth $11.5 billion by 2028.